Firstly, I beg to differ with the author for suggesting a specific age group for reading this story. Secondly, this story is awesome. Who would not like to embark on a magical journey into a magical world! Christopher makes us travel into a world where fantasy and reality exist side by side. This story is about taking risks and opting for the road never travelled. Yes, it takes courage to choose something one does not know about and follow just that. Life has its set of unaswered questions but it is only the one who seeks it that finds it. The language is simple yet has the capability to instantly involve the reader as the storyline progresses. Though there are no direct connotations but Christopher gives a subtle message. 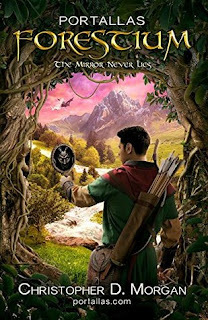 Christopher succeeds in portraying that mirror of life never lies. The characterization is apt for the setting. You would love to hate the antagonist and live to love the protagonists. This story will make you squirm in your seats as you anticipate what happens next. It will make you go awww as love blossoms. It will make you wonder at the grandeur of the magical place. To sum up, whether you are young ir old, have teens at home or not, you must read this book whenever you want to reach out to your inner child. Really awesome story. P.S - Christopher is sure to find childlike adult fans along with teen lovers of his writings. Waiting for the next in this series.